Yes, you want your cats to get along quickly — or at least tolerate each other. But rushing things can be a recipe for a rocky future! If you go too quickly, your existing cat may get territorial or have such a negative impression of your new cat that it can never be broken. So, start slowly. If you’re getting a new kitten that’s sick, you may need to keep the cats separated for a bit longer. A spare bathroom is the perfect spot to make your second cat or kitten comfortable. Ideally, you want a room that doesn’t have a lot of in-and-out traffic. Set up a bed for your new kitty, include food and water, and get that litter box in there, so your cat is totally comfortable. Allow your cats to smell each other with the safety of a door between them. This is a safe way for your cats to get used to each other’s scents without feeling too threatened. You can put your existing’s cat food bowl near the door to encourage interaction. After a few days, you also can try putting a toy at the bottom of the door to see if they want to play. Cats have scent glands in their cheeks. You may want to rub a toy or a blanket along your new cat’s cheeks and give it to your existing cat. Then, do the same with your existing cat to your new cat. This can help your cats get used to each other’s scents. Speaking of pheromones, we have clients who swear by diffusers that release stress-reducing cat pheromones (brands like Feliway). You can buy them over the counter at local pet supply stores in Castle Rock. If you want things to go smoothly, though, it doesn’t hurt to give them a try. Set the diffusers up near the room where you’ve confined your new cat or kitten, and let the stress reduction begin! 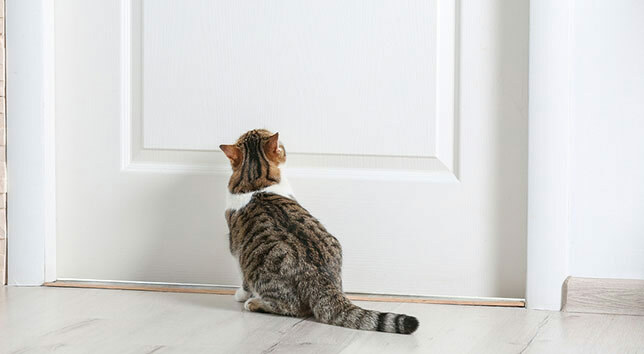 Once your second cat or kitten is familiar with the confinement area, give that cat some time to visit other parts of your home too (without interacting with your existing cat). Temporarily confine your existing cat to a different room. The thing to avoid is just opening the door and letting your cats go at it. Your cats are more likely to fight if you skip or rush the steps above. It really depends on each cat’s personality and history. At the very least, expect some hissing and standoffish behavior. It’s normal for cats to express their displeasure with each other in their initial encounters. To minimize the risk of swatting, lunging and fighting, consider putting your cats on harnesses with leashes. That way, you can quickly separate them if things get too heated. You also may want to have a squirt bottle handy. Supervise at least two interactions before you decide whether it’s time to let the cats out together in your home. Take heart, it will take some time for your cats to tolerate each other. Give it a good two weeks and expect some issues. It can take a little while to know whether this transition will work. Make the transition more gradual, and be sure to supervise interactions. After a few weeks, you’ll have a better sense of whether your cats are going to be able to get along. Some cats may never like each other, but they’ll form a truce and avoid each other. If your cats are still viciously fighting or marking territory at three to four weeks, you may need to revisit your options. If things are really bad right away, you may have to consider your options sooner. Will cats of certain genders get along better than others? There isn’t hard proof that gender can make a difference in whether your two cats will get along or not. With that said, there is some anecdotal evidence that suggests you may have fewer issues if one cat is male and the other cat is female (rather than two females or two unneutered males). Has been tested for FELV (feline leukemia virus) and FIV (feline immunodeficiency virus). 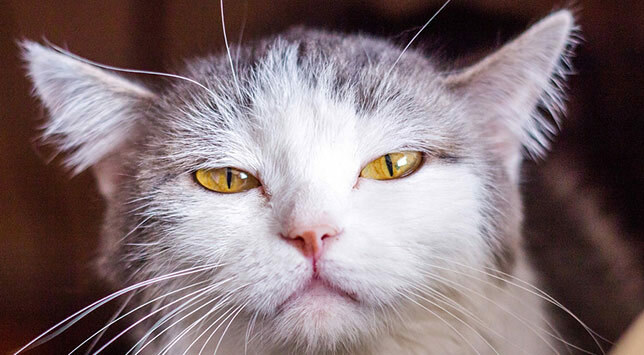 These are diseases that can be transmitted to your existing cat … and put your kitty at risk. Gets a physical exam. It can help you make a more educated adoption or purchase decision. That way, you don’t bring a cat or kitten into your home that could have issues, such as an infectious illness. 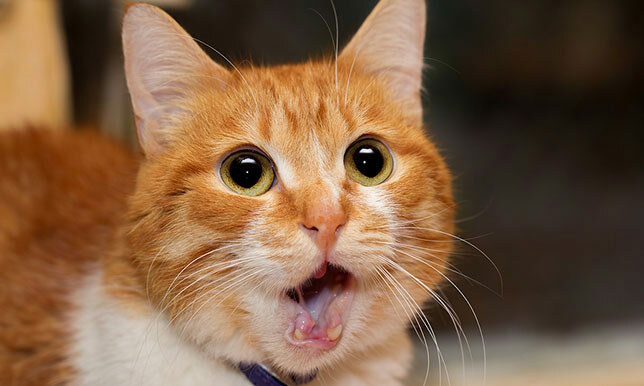 Also, make sure your existing cat is up-to-date on his or her shots, including rabies and feline distemper. Finally, you’ll want to make sure your cats are spayed (females) or neutered (males). Most shelters take care of this as part of their services, but always ask. You’ll have more issues with cats marking their territory in your home if you have male cats that are not neutered. Keep in mind that kittens don’t have a fully-developed immune system yet. It’s likely your kitten won’t have all of his or her kitten vaccinations. 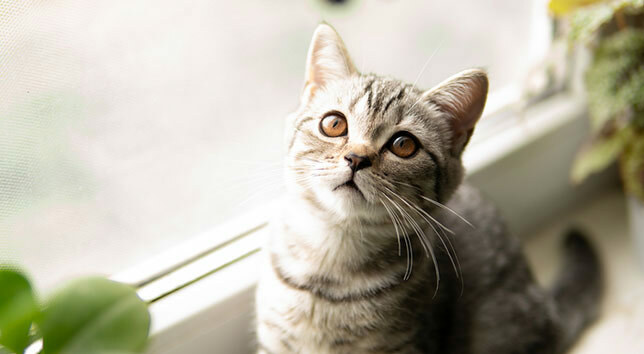 This means kittens can pose a higher risk of disease to your existing cat (and to themselves). Typically, kittens are fully vaccinated around 16 weeks of age. 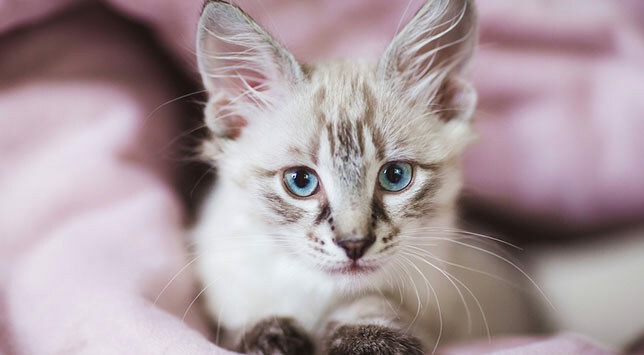 If your kitten is sick, you may need to put your kitten on a longer “quarantine” from interactions with your existing cat. We encourage you to chat with our vets about that. Each situation is a little different. On a positive note, kittens tend to be more tolerant of change compared to adult cats. 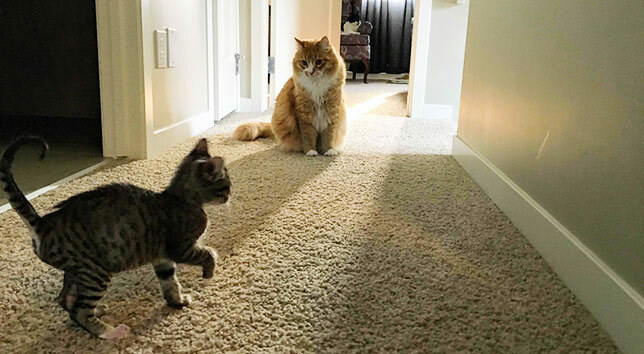 So hopefully, the introduction between your cats will go smoother! If you’re getting your cat from a rescue group or local shelter, your first exam is free within 14 days of adoption.